With red or green yarn, make a magic ring, ch 1. Rnd 20: (invdec, sc in next st) six times. (12 st). Stuff apple through hole. Rnd 21: invdec six times. (6 st). Cut the yarn, leaving a long (approx 12″/30cm) yarn end. Note: Your apple will look more like a lemon at the moment, but don’t worry: that will all change in a moment! Using a yarn needle and the long yarn end from the apple, close up the remaining hole at the bottom of the apple. Use a finger to push the top of the apple down to form a dimple (don’t worry if it won’t stay in this position). Pass the yarn from the bottom up through the apple to the magic ring at the top centre, then insert the yarn needle at the top, one stitch away from where it exited the apple, and pass the yarn end back down through the apple to the bottom. Draw the yarn tighter until you like the shape and the top dimple stays in place. Knot the yarn at the bottom of the apple so it stays in this position (the knot will be covered later). Pass the yarn end through the apple, coming out somewhere along the apple’s side. Draw the yarn tight, and snip the end close to the apple. The yarn end should retract back inside the apple after it is cut. Using a yarn needle and the long yarn end from the stalk, pass the yarn through the apple from top middle to bottom middle, so the base of the stalk sits in the dimple at the top of the apple. Make 3 small overlapping stitches at the bottom of the apple, to form an asterisk shape. Pass the yarn end back up through the apple to the top. Knot the yarn end and the starting tail from the stalk together. Thread both ends onto the yarn needle and pass them through the apple, coming out somewhere along the apple’s side. Draw the yarn tight, and snip the ends close to the apple. The yarn ends should retract back inside the apple after they are cut. thank you for letting me chrochet your apple pattern. I was trying to fine something for my great grand daughter pre-school teacher for Christmas. this will make a great Christmas gift for her. thanks again. I am 68 years old and very thankful there are people like you still out there that love to chrochet like myself. Here you see the apple. I stuffed it with a little muslin baggie of cinnamon, cloves, allspice, and ginger, so it’s really a potpourri apple! I am 9, and i crocheting is my hobby, i saw your pattern and sat down immediately to make it, i love it so much and now i just finished the 7th one! i do have a question, how to you do a invisible decease? please do answer, i have to know! Thank you! I love its shape! Great pattern and very easy to follow. I like how you gave reassurance along the way as to the shape of it. Thank you for sharing this pattern. I was wondering what I would need to do to make the apple larger, like 12 inches? Great pattern, thank you so much for sharing! I’m making these as teacher gifts this year. Can this be knitted, I don’t know how to crochet? I’m afraid not, TJazzie – knitting and crochet are entirely different crafts, and there’s no simple way to convert one to the other. Thank you so much for an easy but beautiful apple. I made these for my children’s teachers. The teachers loved them. I stuffed mine with popcorn seeds instead of stuffing and it worked great. I just want to say thank you again. I love to crochet and these were perfect. Hi June. Love the pattern. It is so cute and is so easy. Can you give me any tips for passing the yarn needle through the apple. The needle would just not go through! Do I have it stuffed too tightly, although it does not seem to be. Is it the type of stuffing…..it’s a craft poly-fill, 100% polyester fiber. Thank you! Karen, it sounds like the problem is in the type of stuffing you’re using – there are many different types, and, confusingly, they’re almost all 100% polyester, so it’s difficult to know what you’re getting. (It also makes it difficult for me to describe the differences – I have a blog post planned about stuffing types, but I’m still not sure how to write it!) In future, you might like to look for a different type of stuffing, and look for words like ‘premium’, ‘high loft’ or ‘supreme’ – they are usually a clue to the better quality, springier, bouncier, smoother stuffing. Buy a needle with a sharper tip that can force its way through your stuffing (but still has a large enough eye to fit your yarn into). I wouldn’t use a sharp-tipped needle for sewing pieces together, as they split the yarn too easily, but they do have their uses! Use a finer yarn or thread with a smaller needle – pass it through the apple several times, going through a different stitch at the ends of the apple each time, to spread the load so the thread doesn’t slice through your yarn. Thank you so much for this pattern! I was looking all over for a good apple pattern to pair with an apple hat and booties set, and this is the perfect one! Thank you! Your pattern is great! Thank you so much! This was my first amigurumi, and it was easy to do and turned out great! Thanks so much for the apple pattern, it’s a clear and simple pattern. Thank you for making it free. Hello June. This is a beautiful pattern. Thank you for making it free! One of my favorite teacher’s birthdays is on Tuesday. I have decided to make her one of these and give it to her as an “apple for the teacher” gift. Only this apple will last longer than a real apple, as a real apple would rot. I am sure she will love it. June – thanks so much for the Apple pattern! I’m off to the yarn store to pick up yarn to make a bowl of “Everlasting Apples” for my Apple Kitchen! I’ll be back later to buy more! This is a great pattern, really easy to follow and a lovely result – thanks for sharing it! I love your picture tutorials! thank you SO much! ! ! ! Thanks, June, for the wonderful apples!! thank you so much for your hard work 😀 these apples are awesome. my little sister has been begging mom for a play food set, so i guess i’m going to make one of these apples, a lemon, an orange, and a pumpkin for her. plus, your website is the best one i’ve seen in a long time. I”ve just learned how to crochet in the last 2 weeks and this was my first non-flat project. Thanks so much for making it so easy to learn! I can’t wait to pick my next pattern. Thank you for sharing this wonderful apple craft with Projects for Preschoolers. This is such a great idea to create for pretend play food sets for young kids… yummy fun! These are so pretty!! I love them! This is lovely. I can imagine a whole bowl of these on my table! Thank you! So cute! I might try making these and felting them. I love their realistic shape. As always, I appreciate your attention to detail. Makes all the difference. 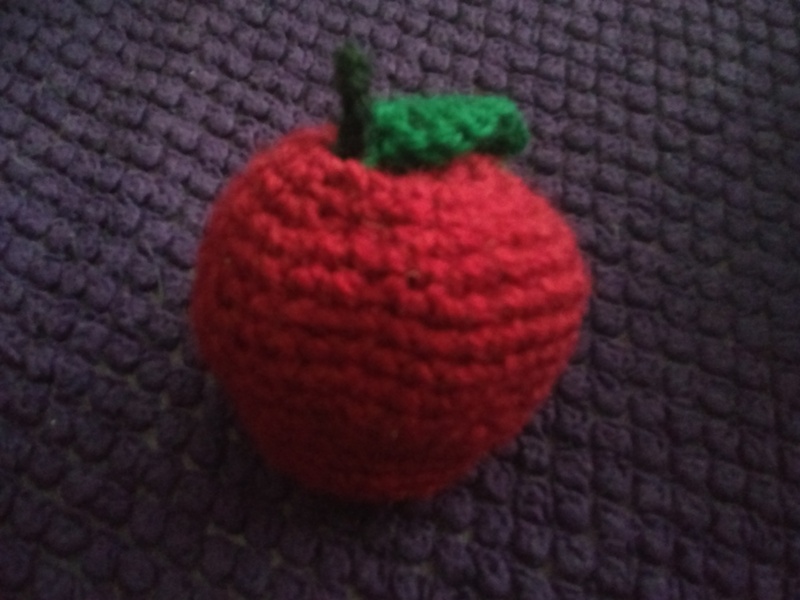 I love your amigurumi apples – they are a great shape and look good enough to eat! Very nice – spoken as one who has tried out the apple shape, its not as easy as it would seem! you are so talented and generous!